02/10/2019 - The Hershey Bears swept the Charlotte Checkers in back-to-back games this weekend at Giant Center with a 2-1 win on Sunday night. Hershey extended their point streak to 12, and set a new season-long, six-game winning streak in the victory. The Bears opened the scoring in the first period, and rode a 1-0 lead into the dressing room after 20 minutes. At 16:01, Shane Gersich entered the offensive zone with a chip and chase play along the left wing. After a drop pass along the boards to Brian Pinho, he found a streaking Jayson Megna into the slot wide-open. A quick shot from Megna beat Checkers goaltender Alex Nedeljkovic to give his club a 1-0 lead. Shots after one period were 12-10 Charlotte. Charlotte finished the game 0-for-5 on the power play, but continuously attempted a backdoor deflection passing play on the man-advantage. Hershey's penalty killers remained up to the task and sufficiently blocked passing lanes in the slot. At 10:09 of the second period, Charlotte tied the game while even strength on a combination passing play. On a transition following a successful penalty kill, Nicolas Roy scored his 14th goal of the season after finishing a backdoor feed from Nick Schilkey. At 17:05, Hershey went on their fourth power play of the game after Dan Renouf was called for roughing after the previous whistle. Only 12 seconds later, Jayson Megna appeared to score on a deflection in front of the net off an Aaron Ness shot, but the officiating crew deemed the puck was played by Megna with a high-stick. The goal was disallowed, but the Chocolate and White soon went on a 5-on-3 power play at 18:05 after Clark Bishop was flagged for tripping. In the two-man advantage, Riley Barber blasted home his 21st of the season at 18:29 to restore Hershey's lead. Shots after 40 minutes were 20-16 Checkers. 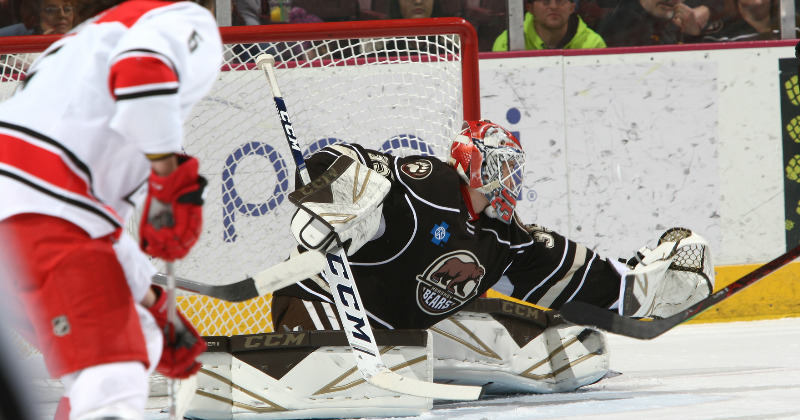 Hershey put forth a gritty defensive effort in the third period, headlined by remarkable stops by Ilya Samsonov. Samsonov finished the night stopping 29 of 30 shots to help preserve the Bears 2-1 lead to the final buzzer. The Bears improved to 26-20-0-5 with the win, and won the season series over Charlotte with a 3-0-0-1 record in four games. The Hershey Bears return to action on Wednesday, Feb. 13 against the Wilkes-Barre/Scranton Penguins. It's Capital BlueCross Baseball Cap Night at Giant Center. The first 5,000 fans will receive a baseball cap, courtesy of Capital BlueCross. Puck drop is scheduled for 7 p.m. Ticket information is available online at HersheyBears.com.